Saturday, we welcomed our newest members to the Capital Area Chapter for class orientation. Such great smiles seen on the patio of the Laura Bush Community Library. We look forward to meeting you out in the field, and learning of all the great work you do! I was fortunate to be able to attend the Texas Master Naturalist 17th Annual Meeting (October 21-23, 2016), and boy did it give me a lot to think about! The meeting was held at a resort on Lake Conroe, just north of Houston. Ironically, I and so many other naturalist attendants spent most of the weekend indoors watching Powerpoint presentations, but it was very worthwhile. Here are highlights from some of the sessions I attended that left an impression on me. The only field trip I attended was on Friday afternoon to the nearby WG Jones State Forest. This has become an island of pine forest habitat in a sea of suburban development, with people’s backyards coming right up to some of the fence lines! Challenges this State Forest face include increased flooding and increased use by entitled neighbors who don’t understand what’s best for the forest and its endangered Red-cockaded Woodpeckers. Saturday morning I finally got to attend the Texas Stream Team’s Standard LaMotte Kit water quality training. 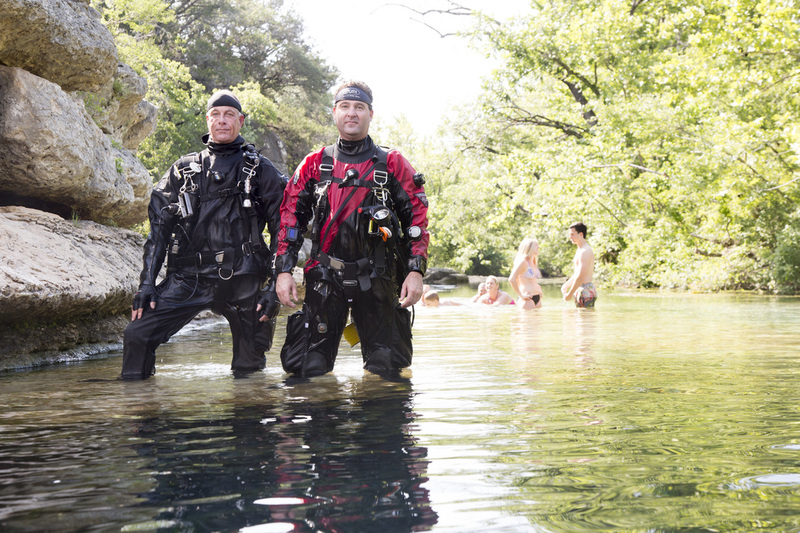 This is something I’ve wanted to do since our 2016 CAMN class water training at The Meadows Center in San Marcos. I plan on monitoring creek on Lake Creek Trail in my northwest Austin neighborhood. During the training we assumed my monitoring partner association was going to be the LCRA, but it turns out Lake Creek ultimately feeds the the San Gabriel River. I discovered the Good-Water Master Naturalists are monitoring the same watershed, so I’ve contacted them to see where I go from here. And Laura or someone on her team will train you in its use if you ask! Also, Marsha specifically mentioned how successful Austin’s Amphibian Watch project has been. We need to publicize it more! In a presentation called “A New Era for Wildlife Management,” Richard Heilbrun with TPWD gave a brief history of conservation legislation and information about a new bill which could ultimately provide Texas with $50-64 million annually to fund our state conservation plan, laser-focused on our SGCN list. It’s HR 5650 introduced by Alaskan congressman Don Young. Richard is spreading the word about this intriguing proposed legislation! The last presentation I attended was truly inspiring. Long-time Texas birder and conservationist (and old friend) Stennie Meadours had been monitoring American Oystercatcher breeding success on the coast near Galveston, when one of the birds they had banded as a chick died from ingesting a wad of monofilament fishing line. She was inspired to start her master naturalist chapter’s Plastic Pollution Prevention project. It monitors sensitive sites for plastic litter, organizes cleanups, and spreads the word about how damaging plastic (and in particular monofilament line) is to wildlife. An idea she had at the meeting was that maybe something similar to hunting ethics could be taught about fishing. The Texas Stream Team is also starting efforts to clean up and collect data about monofilament litter. In the evenings it was great to do a little socializing with fellow CAMN members who also attended this year’s meeting. I feel more connected with them and more willing to reach out when questions or new ideas come to mind! On Wednesday night, CAMN member and recent Master’s degree recipient, Beth Crouchet, presented her research at our monthly public meeting. 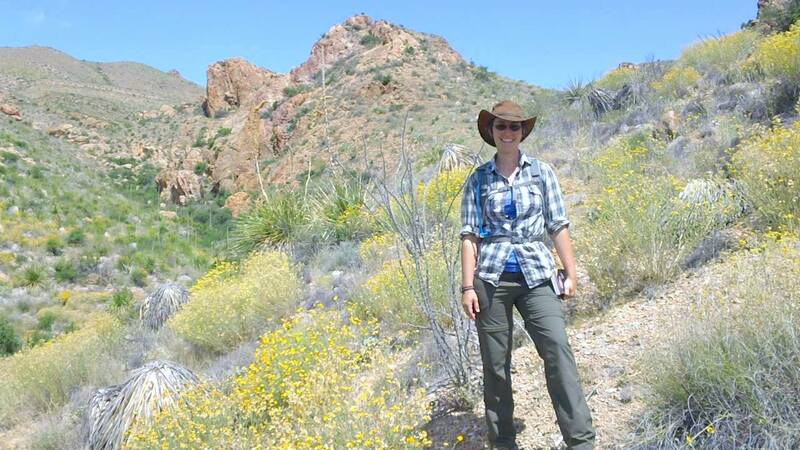 She outlined her methods of collecting field data over two years from 64 sites spread across Texas, focusing eventually on mostly Central Texas and o 9 tree species, including live oak (Quercus fusiformis), yaupon holly (Ilex vomitoria), ashe juniper (Juniperus ashei), Texas persimmon (Diospyros texana), and others. Beth was interested in discovering some answers to what specific site factors affected trees when they encountered the intense Texas drought in 2011. Some of those site conditions include soil type, soil depth, slope, aspect, exposure, and site-specific weather data. 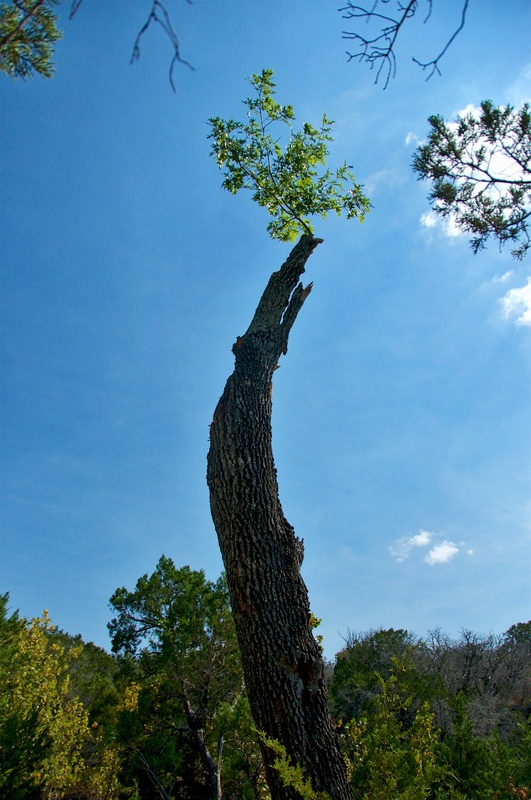 In her research, Beth defined some basics, such as what actually constitutes a dead tree – how much of the crown must be dead? Does a re-sprouted tree count? And how recently can it have died? With extensive data mining derived from her data set, Beth was able to demonstrate that certain species, for example ashe juniper, showed more likelihood to die back during extended hot drought – periods not only of little precipitation, but ongoing high temperatures. While this was an expected outcome, her data revealed a few interesting conclusions. Some species, including yaupon holly, showed a striking ability to thrive over extended hot drought conditions, while others were not as noticeably impacted. In some ways, Beth’s talk and her research opened many questions, inviting audience members to wonder what trees might fare better in intentional landscape conditions, or what ongoing drought might mean for future forest species diversity. While the work outlined in the talk covered a somewhat specific look into tree mortality – Beth purposefully stayed away from aggravating factors linked to insects, fire, lightning, etc. – a parallel view of her presentation might reveal the process behind field research and deriving meaning. Not just the glimpse of what kills trees, but the work it takes to turn a big question into answers. One gets a sense of the painstaking work… the parameters to be defined, second-guessed, re-defined, the amount of time spent in hiking boots on Texas hillsides and plains, the statistical analyses done late at night while the kids sleep, the singular devotion to following something to a conclusion at the expense of many of life’s other demands and desires. Coincidentally, it turns out, Beth’s not the only one looking at similar factors. 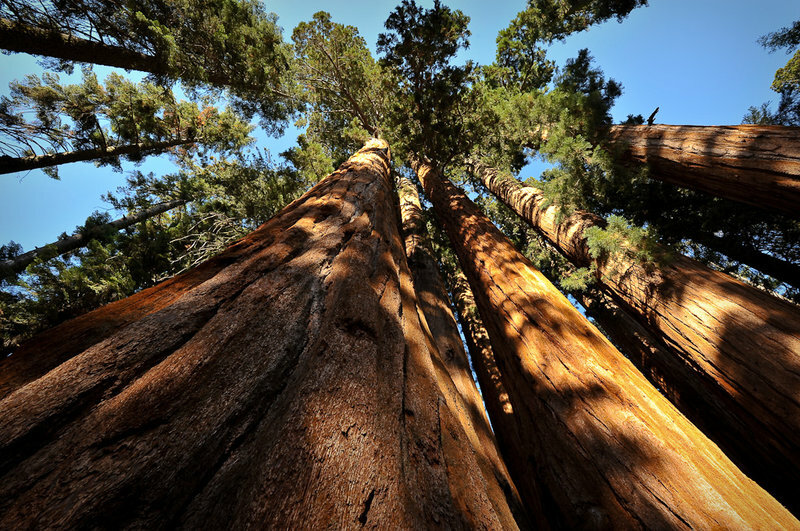 The day after the meeting, NPR posted a story about the canopy-swinging biologists – and their drones – researching how certain giant sequoias are surviving California’s hot drought. Read more about it here. 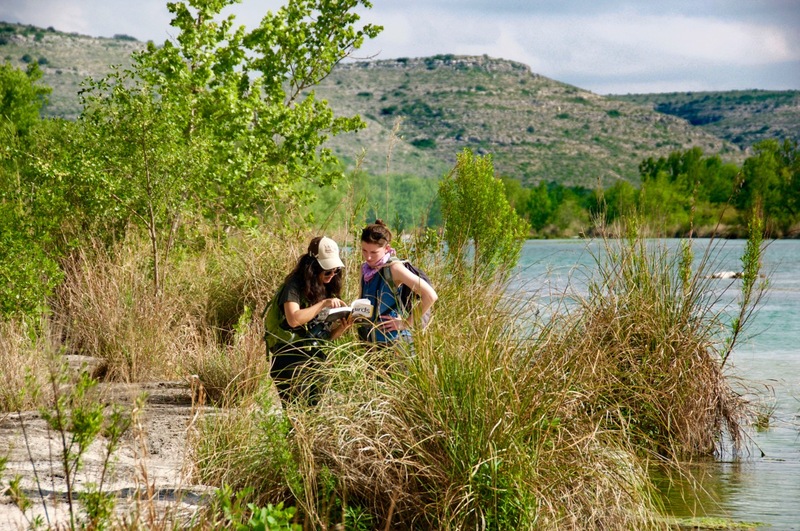 Want to be a Texas Master Naturalist in the Austin area? Capital Area Master Naturalist (CAMN) volunteers learn from experts in the natural sciences – including Texas Parks and Wildlife natural resource scientists, City of Austin hydrologists, University of Texas mammalogists, and NOAA meteorologists – about the unique characteristics of the Central Texas ecoregion and how to give back to their community through public outreach and the stewardship of our natural surroundings. 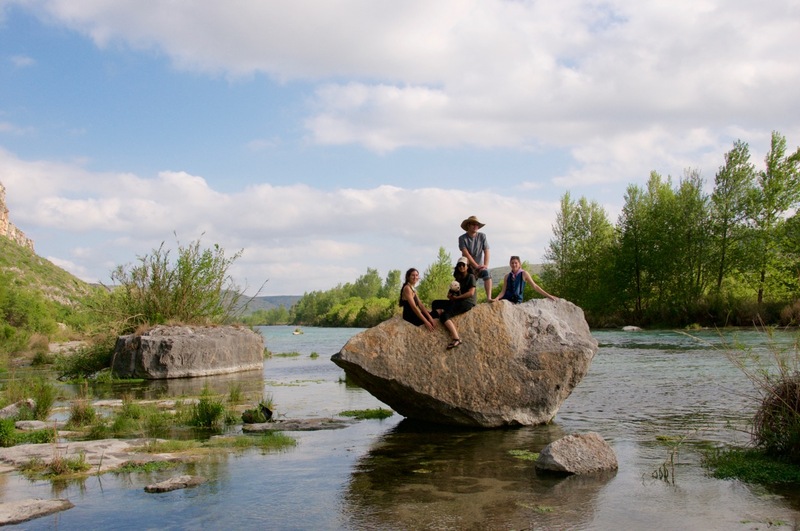 Crawl through caves, sample river water quality, hike preserves restored by prescribed fire, learn plant identification, or document your findings through photography and journaling… all while sharing with a like-minded group who often go on to become life-long friends. Applications for the Capital Area Chapter of the Texas Master Naturalist program open August 1, 2016 for the orientation and training classes that begin in November. Our 2017 class will run on ten selected Saturdays through April, 2017. 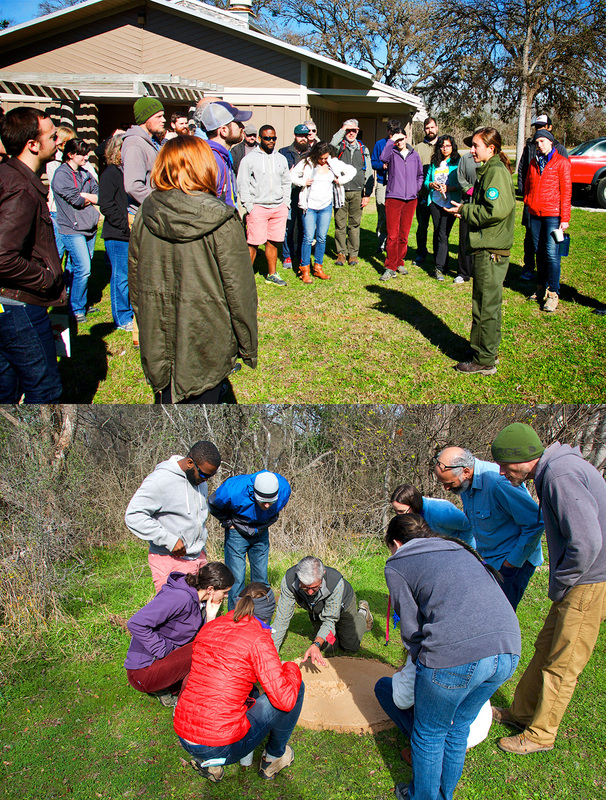 Successful trainees give back to their community by completing at least 48 hours of volunteer service and continuing education each year to receive their certification as a Texas Master Naturalist. To learn more, or to apply after August 1, visit CAMN on the web at camn.org. No previous experience is required other than a passion to learn and a commitment to volunteering. CAMN is a 501(c)3 non-profit organization, and is a chapter of the Texas Master Naturalist program, a partnership of Texas Parks and Wildlife and Texas A&M Agrilife Extension. 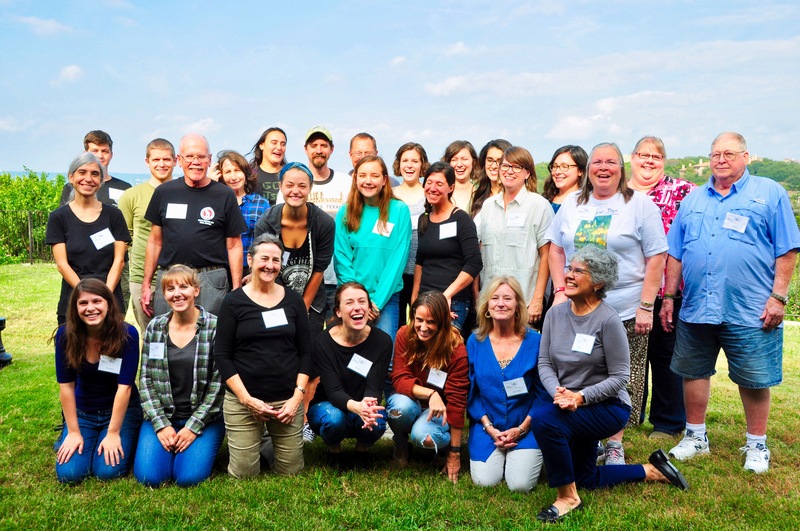 Our mission is to develop a corps of well-informed volunteers to provide education, outreach, and service dedicated to the beneficial management of natural resources and natural areas within their communities. Since our foundation in 1998, we have trained nearly 600 volunteers who have provided around 120,000 hours of service in the Austin area. On Sunday, April 24, Austin Water Utility’s Wildland Conservation Division organized a hike on the Aralia trail, part of the Bull Creek parcel of the BCP, especially for the purpose of sighting golden-cheeked warblers. The hike was led by Jonny Scalise, a biologist with the City of Austin, and volunteers Robert Reeves and Gloria Wilson. Wafer ash, also known as hop tree. Ptelea trifoliata. Saturday morning, April 9th, was a cool and cloudy day with a threat of rain, but Dr. Meissner, our guide through the Concordia University Preserve, made every moment a step into a world apart. He began the hike by pointing out that the hill country terrain of the Balcones Canyonland Preserve has a special feature: small canyons that start out wide and come to a point, providing a special habitat for endangered species such as the Jollyville salamander. He also noted that we would be going through four ecosystems over the course of the next two hours: a slope community, a riparian community, an upland community, and a pond community. The following class of 2015 members completed all their requirements for becoming certified Texas Master Naturalists. Please congratulate them for their hard work! On March 5, Austin Water Utility’s Wildland Conservation Division volunteers Lila, Gloria, Chris, and Audrey led a group on a hike in the Butler Ecological Preserve, an area at the end of Jester Boulevard that is otherwise closed to the public. The beginning of the hike is down a wagon trail through shrubby live oak and evergreen sumac under power lines, suitable habitat for black-capped vireo. Lila stops to tell about the brown-headed cowbird trap before guiding us off the trail and through the woods. She notes that we are now walking through golden-cheeked warbler habitat, mature juniper and oak woodland, pausing on a rocky slope that is in fact a field of cretaceous era fossils. At the bottom of the slope is a running creek, and from the side of the creek bubbles Tenacio Spring, named for the previous caretaker of the land. The base of a tree trunk forms a fiercely guarding gargoyle above the spring. Then back up the trail, past a deep ravine we come to Kiki’s Spring, named for Kent Butler’s childhood moniker. 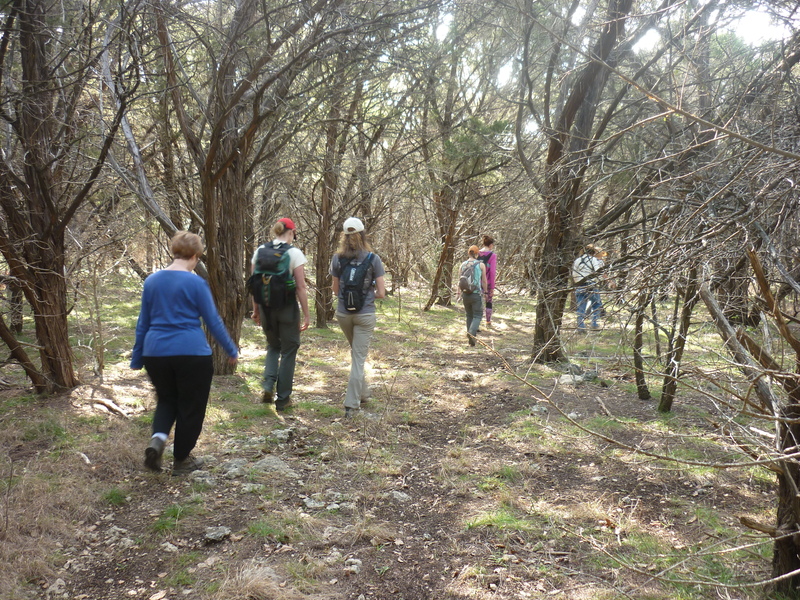 To register to go on this and other hikes, visit Wildland Conservation Division’s online calendar of events at http://www.austintexas.gov/department/wildland-conservation-division. 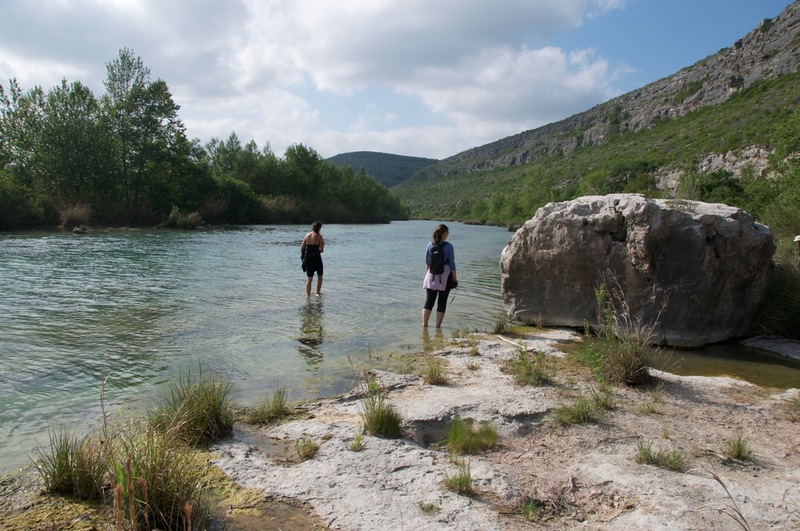 To learn more about Bull Creek Preserve and the entry permit, visit the Bull Creek Eco Web.